Due to overwhelming demand, Somerville started a winter farmer’s market which takes place in the old armory building. It’s not within walking distance of Chez Belm, but it’s worth the short drive to be able to get fresh produce. Some of the summer vendors were there as well as new purveyors, so I tried to spread out my purchases among all of the sellers. Cook’s Farm, a.k.a. “the Pie Lady” had returned, so I bought my usual slab of chocolate banana bread, along with a frozen but homemade chicken pot pie. 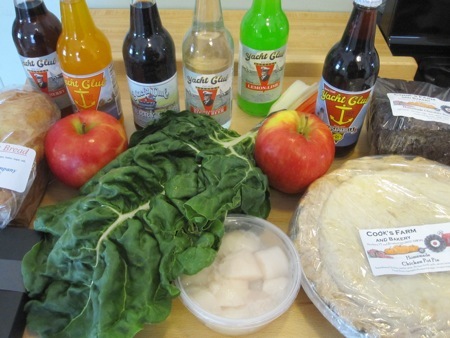 I also bought a few honeycrisp apples, a loaf of english muffin bread, some rainbow chard, fresh bay scallops, an assortment of sodas from Yacht Club Beverages in Rhode Island, and a box of chocolates from Elaine Hsieh, a new chocolatier in residence at the Taza warehouse. 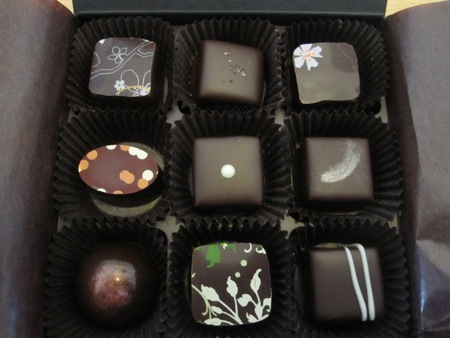 Two of the chocolates are tea-infused, one is a salted caramel, and the piece in the center is “hot chocolate,” a dark chocolate shell with a toasted marshmallow inside. These probably won’t last through the weekend. Today was also a pickup day for the meat CSA. 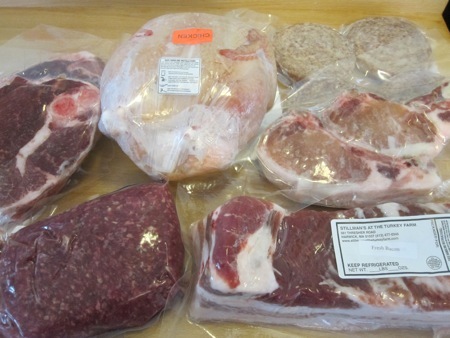 This month’s share consisted of lamb leg steaks, ground beef, a chicken, some pork chops, a slab of pork belly, and breakfast sausage patties. Sausage, eggs, and english muffin toast for breakfast tomorrow, then I’l have to get creative with the rest. Also that Hot Chocolate sounds _amazing_.